This dan buoy is a proven life saver. 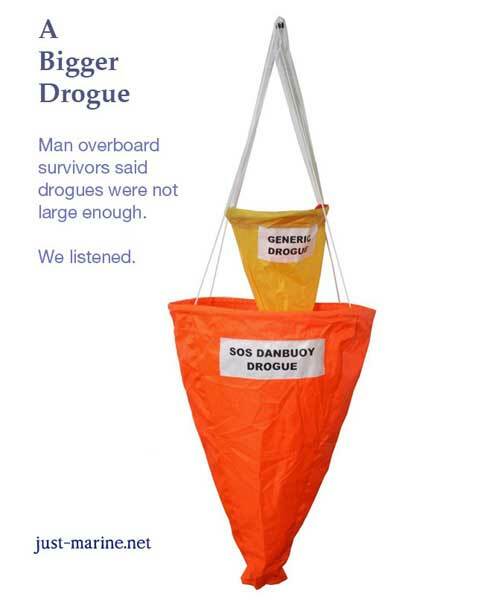 We are the US importer of the award winning SOS Marine self-inflating man overboard buoy, or dan buoy, from Australia. It automatically deploys upon submersion in water. To trigger deployment, just toss it into the water immediately upon losing a crew overboard. Just Throw! Within seven seconds, the buoy self–inflates. This highly visible device makes keeping track of a man overboard far easier. Click to videos, documents, and accessories. What is a dan buoy ? This SOS Marine is specialized for man overboard location marking; its large drogue greatly retards drift. Alternatively, tie the dan buoy to an anchor and line to mark a dive spot, a sunken boat, or whatever you want to find again. Long–line fishermen use dan buoys to mark ends of their underwater gear. Dan buoys can mark dive sites, submerged hazards or objects dropped overboard. Dan buoy is another name for the man overboard pole boaters use to mark the position of a man overboard. In this application, the man overboard pole is usually combined with strobe light, buoy with whistle, and drogue, with pieces interconnected by floating polypropylene line. Bought separately, though expensive, this set up works when properly deployed. But proper deployment is a challenge and the man overboard pole is hard to stow. 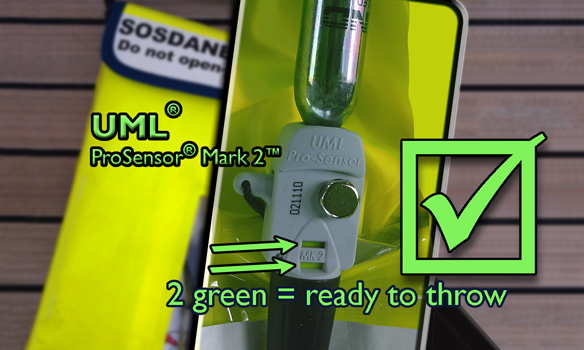 The SOS Marine man overboard dan buoy resolves challenges of quickly deploying man overboard gear by bringing all pieces together in one fluorescent green/yellow unit with whistle and light reflective tape, which is easy to see, easy to hear, easy to stow, and easy to deploy. And its strobe light is located at the top, extending the dan buoy’s visibility in darkness. The quicker you can deploy a man overboard device to someone in distress, the better. A boat traveling at ten knots covers about 1,000 feet in one minute! A boat moving at ten knots covers 1,000 feet per minute. Using a search quadrant of 30 degrees, the search area size increases from approximately 29,000 square feet, at 300 feet from man overboard (20 seconds of travel @ 10 kts), to approximately 258,000 at 1000 feet (one minute of travel). Search area size increases nearly 900% in 40 more seconds. The quicker a good marking device is deployed, the better is chance of rescue. The SOS dan buoy is the easiest to use, fastest to deploy, and most effective man overboard marker available. 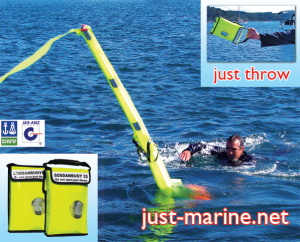 The automatically inflating dan buoy is a must for any offshore boating. It provides a high degree of visibility to the approximate location of someone lost overboard. It is visible from 2000 yards at water level during daylight. This extra visibility may be critical not only for sailing vessels, which may need extra moments to strike sails before recovery can be attempted, but also for powerboats in moderate wind and sea conditions. It can be difficult to keep track of a person’s head disappearing behind swells. Ready to deploy it weighs ten lbs and is the size of a lunch box. Upon Man Overboard! it is just thrown into the water in the direction of the victim. 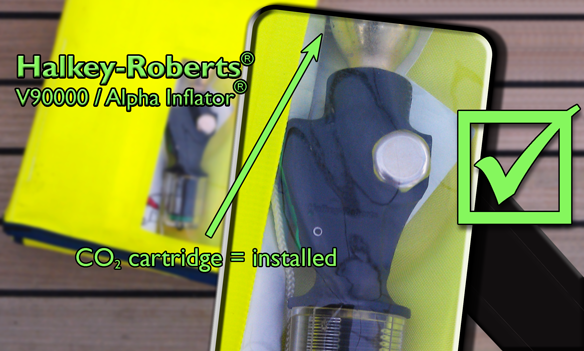 Within 7 seconds of submersion the SOS dan buoy fully inflates, becoming a 6′ high, easily seen fluorescent green inflated pole. The pole includes, at its top, an automatically triggered SOLAS strobe light for easy night spotting, light reflective strips for search light return, whistle for sound notification, large drogue to slow wind drift, handholds for the victim to support himself, and 8 foot long streamer, also near the top, which whips in the wind and seaway providing movement recognition against the background. It meets ISAF World Sailing Offshore Special Regulations, section 4.22. It is used by many yachts in the hazardous Sydney to Hobart yacht race. It is used by navies and rescue groups around the world. It also satisfies US Sailing Safety Equipment Requirements for a man overboard pole. Dave DeLong and Melissa DeLong on Apsaras, a Hunter Passage 450 sailboat, are embarked on an extended cruise. You can follow their adventure and read their thoughts on the SOS dan buoy. They posted the following video, a test deployment of their man overboard buoy, and blogged about it. We have heard criticisms that drogues on man overboard devices were not large enough, from survivors who lived to tell us. They were frustrated at having to swim after devices being blown away from them in severe weather. The self–inflating SOS Marine dan buoy uses an extra large drogue (47″ by 23 ½″ / 600mm x 1200mm) as a result of this input. 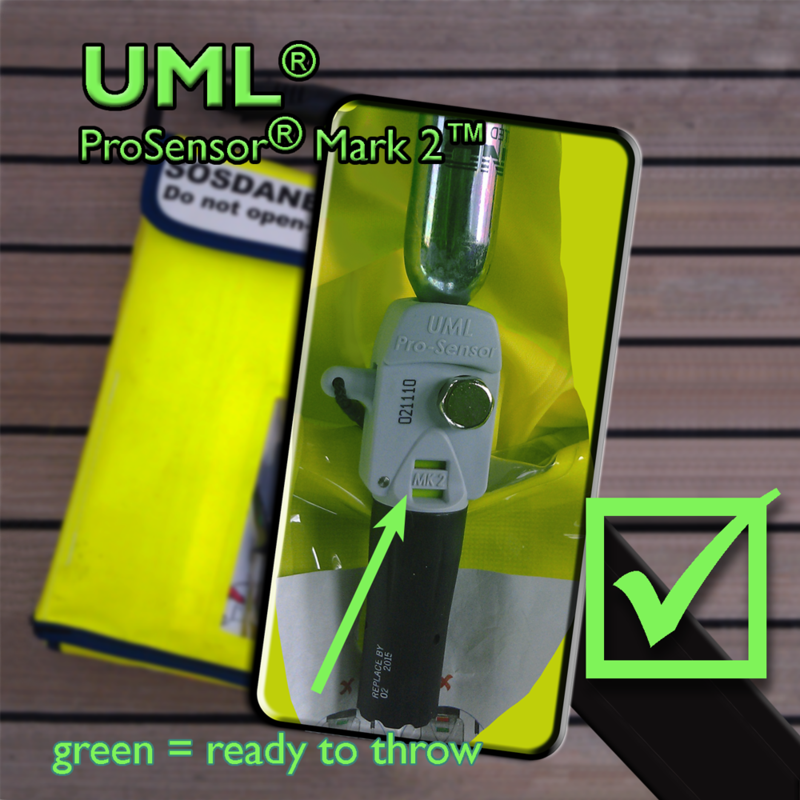 The SOS Marine man overboard dan buoy resolves challenges of quickly deploying man overboard gear by bringing all pieces together in one fluorescent green/yellow unit with whistle and light reflective tape, which is easy to see, easy to hear, easy to stow, and easy to deploy. And its strobe light is located at the top, extending the buoy’s visibility in darkness. 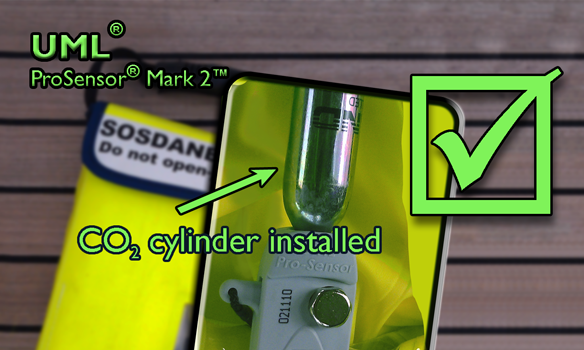 To prepare the dan buoy so it is available for use at any time, simply insert the CO2 cartridge. Check for green; then, to deploy, Just Throw! the dan buoy. Click to view many photos of the dan buoy (opens in a new browser tab or window). The SOS DAN BUOY is manufactured to ISO standard 12402 which applies to inflatable life jackets. Wherever like materials and processes are used in man overboard buoy fabrication, those materials and processes meet elements of the International Standards Organization. 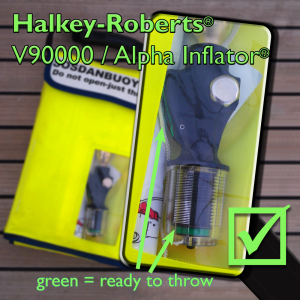 SOS Marine dan buoys shipped in the United States before 2014-12-01 have the Halkey–Roberts V90000 / Alpha Inflator. 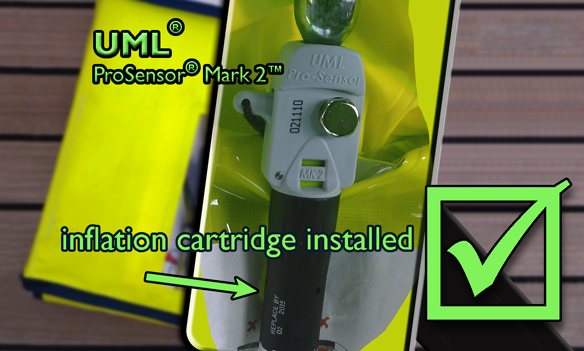 Units shipped after 2014-12-01 have the UML Pro Sensor Mark 2 inflator. These inflation mechanisms take different recharge kits. Installing the recharge kit is slightly different, but simple in both cases. It is simple enough that you can rearm, repack, reuse, even while underway. The dan buoy is field–rechargeable and reusable! Keep spare recharge kits on hand. Glance at the green indicators for reassurance your unit is charged and ready to use. See adjacent pictures. …without the [dan] buoy…I would be dead. Val G, 2016 Ensenada Race MOB survivor Click to his story. Click to buy recharge kits or other spare parts in our online shop. Inspecting the strobe should be part of your annual inspection of the danbuoy. Its battery has a five year shelf life, after which the strobe should be replaced even if unused. Click to the danbuoy strobe testing and replacement page. The images in the section below, For UML Inflator, show the UML inflation mechanism in ready to use condition. 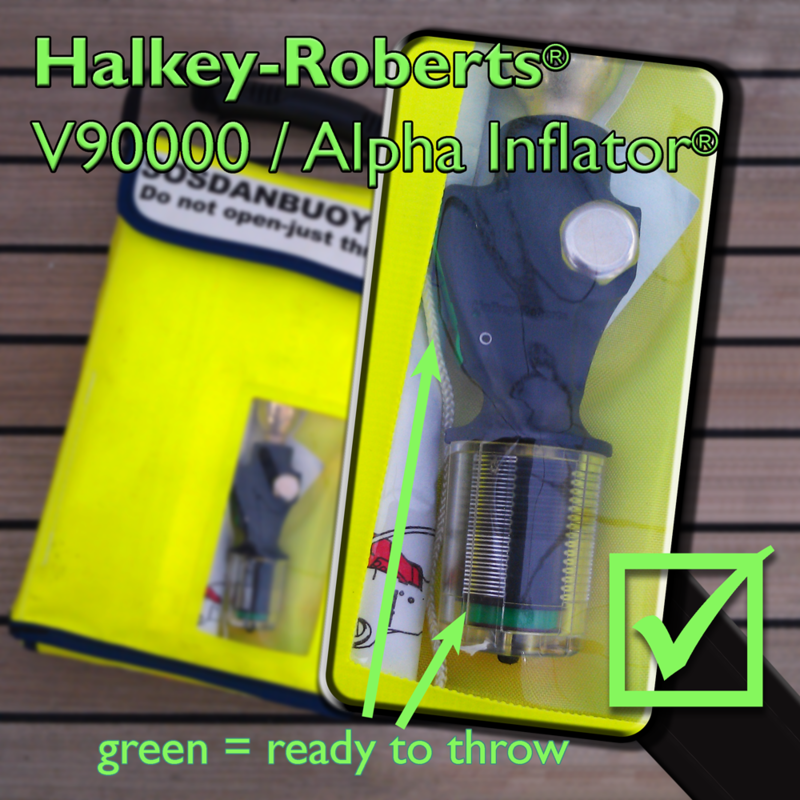 Refer to the section, For Halkey–Roberts Inflator, if your dan buoy has the Halkey–Roberts inflator. The reminder email signup form asks you to confirm your device resembles these photos therefore is ready to use. 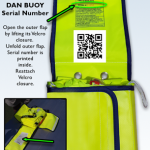 Please locate the serial number of your dan buoy then complete the reminder email signup form. Refer to adjacent image of the dan buoy unfolded. 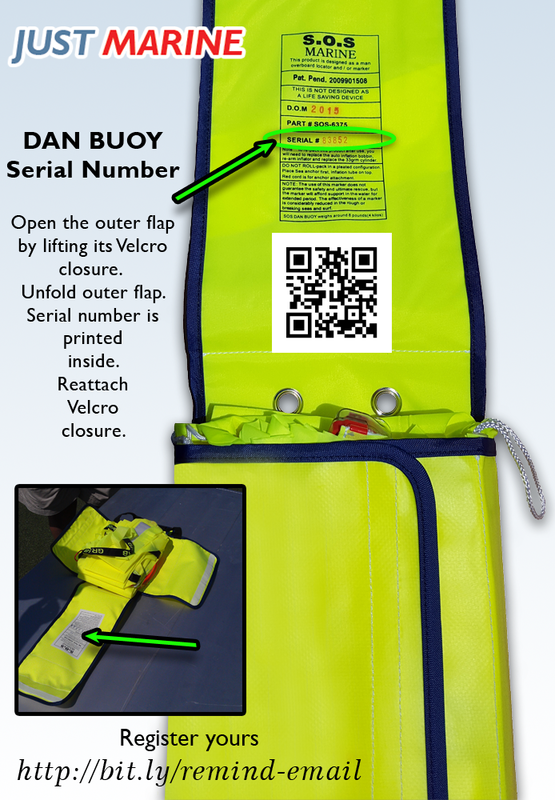 To find the serial number, open the dan buoy’s top flap, which is held down by Velcro. Look on the inside surface of that unfolded flap. Please record the serial number so it is available when you sign up for reminder email. Know Yours Is Ready to Just Throw! Review product documentation up this page to reinforce your comfort level with your dan buoy. 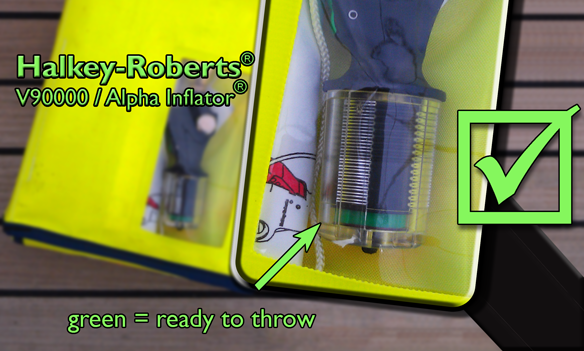 For either style of inflator, the CO2 cartridge should be installed just finger–tight. 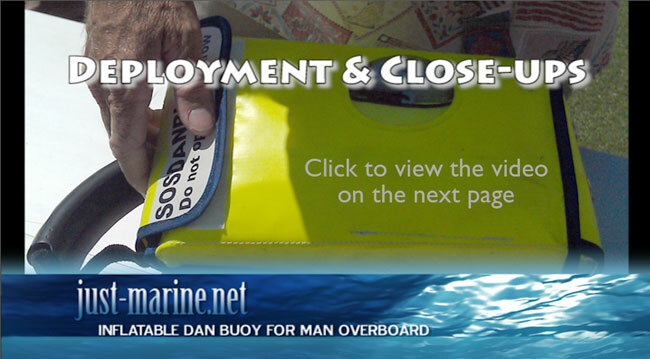 This entry was posted in Safety at Sea and tagged dan buoy, Man overboard by Philip Thompson. Bookmark the permalink.